BOOKTRYST: City Of Brotherly Love Can You Spare A Dime? Philly Free Library To Close? City Of Brotherly Love Can You Spare A Dime? Philly Free Library To Close? In a previous post Seattle Public Library's one week closure was noted as an example of the consequences of the desperate financial straits public libraries now face. But in a much more shocking development, the Free Library of Philadelphia's website now features a pop-up window telling visitors that it will close completely, forever on October 2, 2009 unless funding is forthcoming from the Pennsylvania State Legislature. The Free Library of Philadelphia was established in 1891. By 1898 the Library had the largest circulating collection in the world, 1,778,387 volumes. 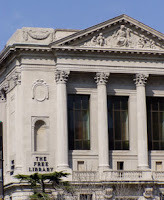 The Central Library, originally housed in Philadelphia's City Hall, was relocated and renamed The Parkway Central Library when it opened in its present location on June 2, 1927. The library is renowned for its Fine Art Prints and Photographs Collection. This archive includes thousands of graphic arts images dating from 1493 to the present. Included are prints by such artists as Dürer, Rembrandt, Warhol and Dali, as well as works by such photographers as Ansel Adams, Bernice Abbott, Ray Metzker, Eadweard Muybridge and Aaron Siskind. The Free Library is also home to a bona fide literary celebrity. Charles Dickens' pet raven, Grip, stuffed upon his death in 1841, has had the bird's eye view of the place since it opened its doors. This famous raven must now be singing in chorus with the celebrated bird of Edgar Allan Poe, wondering if his home is soon to be "nevermore." •All Parkway Central Library programs, including children programs, programs to support small businesses and job seekers, computer classes and after school programs, will be canceled. We are exploring the possibility of relocating the Philadelphia Author Series programs to other non-library facilities. •All community meetings at our branch and regional libraries, and the Park Centrail Library will be canceled. Clearly a drastic and simply unacceptable scenario for the City of Brotherly Love. One can only hope that Pennsylvania's lawmakers are as watchful as Grip, and will see their way clear to supply the funds the Free Library of Philadelphia needs to stay aloft.